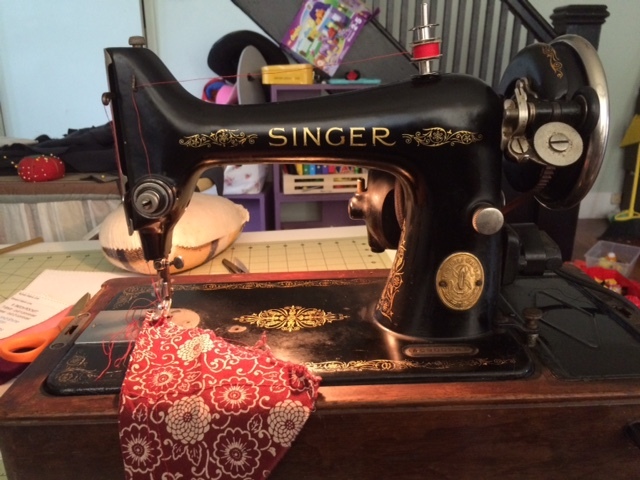 Inder Loves Folk Art: Me Made May 2015 Wrap Up and a "New" Sewing Machine! 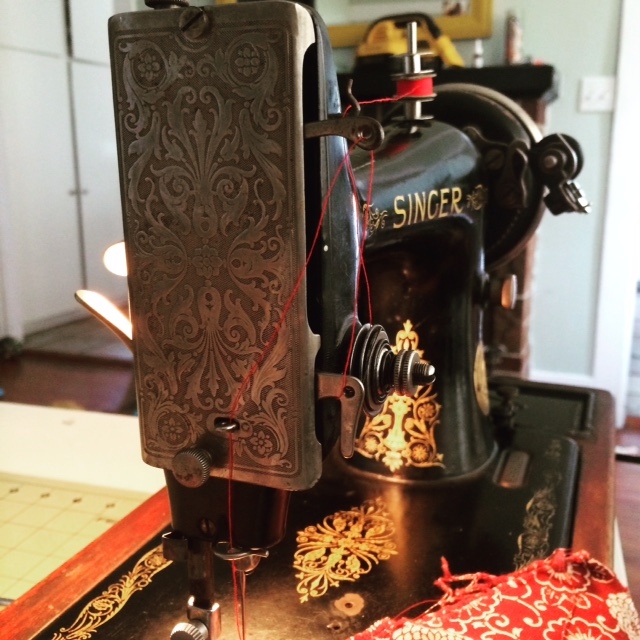 Me Made May 2015 Wrap Up and a "New" Sewing Machine! Greetings readers and welcome to June! Me Made May 2015 has, sadly, come to a close, and it's time for my second installment of MMM pics on the blog. I really had a lot of fun Instagrammin' along with so many of you and sharing my me-mades. I was honestly surprised that it was so easy (more of my wardrobe is handmade than I realized) and I am super pumped to continue to sew for myself! 1. Myrtle Dress, 2. Lisette B6182 Top, 3. Self drafted rayon skirt (recently altered), 4. Lisette B6182 Skirt, 5. Bess Top, 6. B6182 Top and Linden Sweatshirt, 7. Unblogged Plantain Tee, 8. As-yet-unblogged Linden Sweatshirt and Mabel Skirt, 9. Archer Shirt, 10. Plantain Tee, 11. Lisette top and as-yet-unblogged black Mabel Skirt, 12. Bess top and Everyday skirt, 13. Archer Shirt, 14. Alder Dress, 15. As-yet-unblogged Lisette B6169 Dress (shortened to a tunic). "June Gloom" came early to the San Francisco Bay Area this year (although I'm told this is "May Gray" - go figure! ), and we were more or less fogged in for the second half of May, which changed my wardrobe choices quite a bit - my Linden sweatshirts were in regular rotation (including my latest version of this pattern), and leggings, scarves, and woolly slippers made an appearance in addition to my usual cardigans, much to the surprise and confusion of my inland Instagram friends who are already complaining of heat waves. Yep. This is "summer" in the Bay Area. If you're lucky, the sun finally peeks out sometime in the afternoon. In my parts "layering" is a lot more than a fashion statement and cardigans are a year-round staple. The beer, on the other hand, is pure fashion statement. ;-) The beer pics started because I just wanted to have a little fun with the photos and then after a while, people began to expect beer in the photos and I had standards to keep up! I do really love my IPA (West Coast IPA, that is, everyone else's IPA is weak sauce). When it comes to beer, the more bitter, the more better ... uh ... the bitterer, the betterer. Or something like that! Just pass me a damn IPA, would you? Me Made May was definitely an inspiration to me, and I spent a lot of time sewing for myself in May. 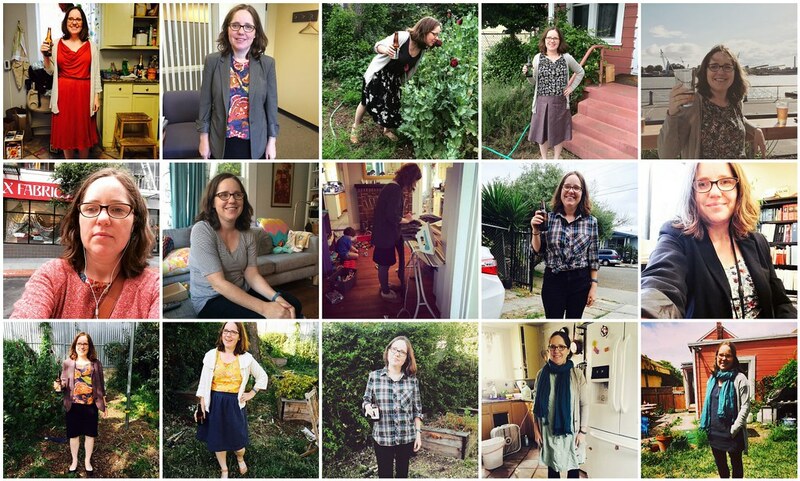 I'm behind with blogging, but I completed 3 tops, 1 skirt, and 2 dresses/tunics this month. I also finally took apart and altered a skirt that had been sitting in my "fix" pile for ages. Not too shabby! I am feeling really energized to continue to build my handmade wardrobe. I am really going to miss seeing pics of all my buddies in their makes. A work friend found it in a pile of things slated to go to the landfill (it is incredible to me that it hadn't been "picked"! 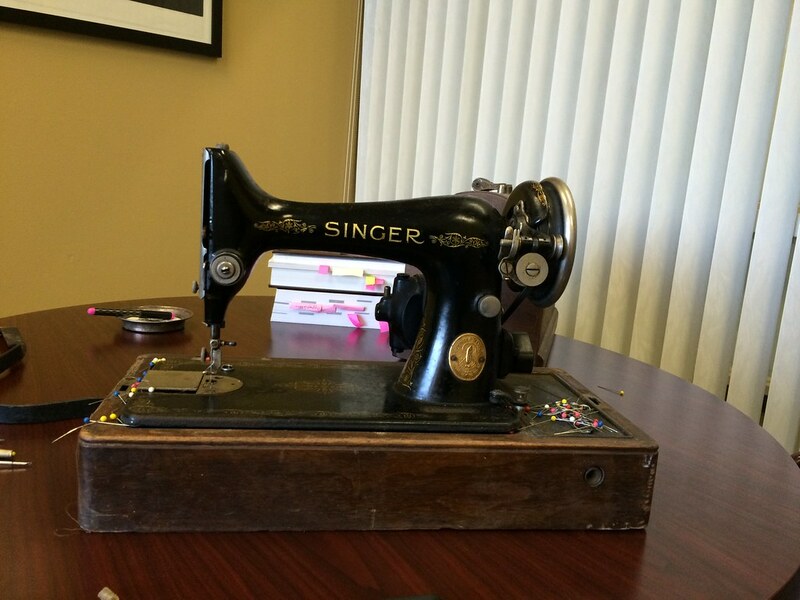 ), and knowing that I sew, she speculated that it was probably a sewing machine, and nabbed it for me. Well, "nabbed it" is probably an exaggeration because this baby is heavy. More like "slowly lugged it away from the trash pile and struggled mightily to get it in her car." Then lugged it up the stairs to my job on the third floor of City Hall, where I just couldn't wait to know what was inside the locked wooden box. The moral of this story: It pays to tell everyone about your sewing hobby, even if this means boring some people to tears, because you never know who will find a vintage Singer in a pile of trash and think, "Who was it that was boring me to death talking about how much they love sewing?" You are very welcome. I did a little online research on wooden singer boxes and learned that you can usually open them with a small flathead screwdriver. Well, my coworker just so happened to have some tools in his car, and I was able to open up the case right there. There was an audible "AAAHHHHHHHHH!!" when that cover came off. It is indeed a sewing machine, and a pretty one at that! I could tell it was in rough shape and missing a few parts, including the thread spool holder. I wasn't sure what that random metal "crow bar" to the bottom right was, but later learned it is a knee lever! Since the machine didn't have a cord, I couldn't tell whether and how she was running. 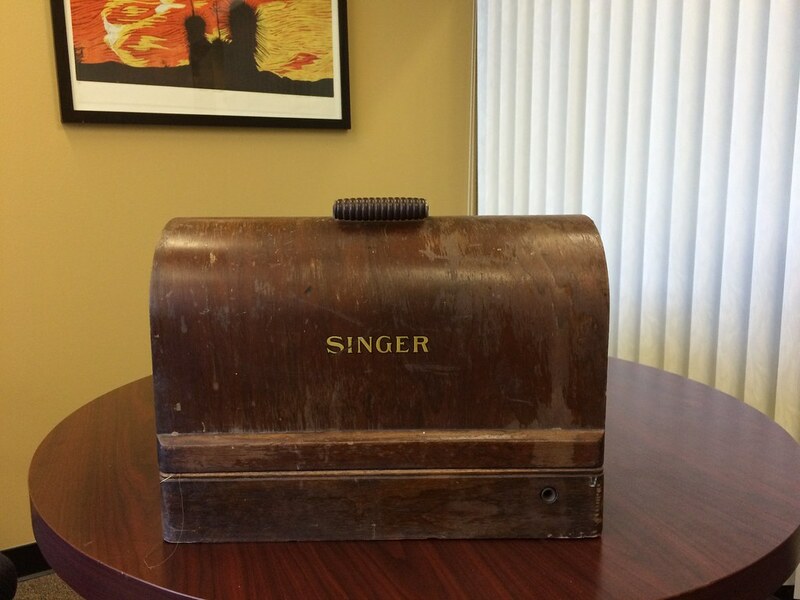 So I lugged this lovely thing out to my car and took it straight to my friendly (or grumpy, depending on the day) local Singer repairman, who told me that this is a Singer 99, made sometime in the 1930s or early 40s. Four or five days and $85 later, I took her home, cleaned up, repaired, and running like a top! As Jim explained, this was obviously a very well-used machine. No "cherry" condition here. You can see where the gold paint is actually worn off in front of the presser foot, from years of pushing fabric over it! Jim touched up the paint a bit here and there, replaced a few parts, and gave it a tune up, and you guys, this thing sews like buddah. Listen to that sound!!! It's music to my ears (don't mind the television and kids screaming in the background - that's my life!). One of my favorite clever little features is the little bobbin lift button in the bobbin case. Check it out! And since this machine uses a knee lever rather than a foot pedal, it will be the perfect machine to teach Joe how to sew on. Joe isn't tall enough to sit on a chair and reach a foot pedal with his feet, but he is a very mechanically minded kid, and immediately took to this machine. I was especially impressed with his speed control, because this machine wants to go fast. Watching this video, I realize my help was totally not needed, and he was two steps ahead of me! Ha! Joe is clever with tools and machines just like his father. I don't know how interested he is in actually sewing things (as opposed to just playing with power tools), although he did express some interest in making a "superman cape"! Ha! He's been pushing for a cape for a while, so I bought some (horrendous) poly satin in red, but I don't think that fabric will make for a very good first project (I anticipate having a lot of trouble with it myself!) ... so I'll have to think about this. So that's my new toy! I can't believe this was in a trash pile! It is perfect for quilting and straight stitch projects. This brings me up to four sewing machines in addition to my serger. Because everyone needs four sewing machines, right? (Steve's rolling his eyes so hard it hurts at this point.) I really have no defense at this point, except that trying out different machines, especially vintage machines, is really fun! I just really need more space so that I can keep them all set up at once! 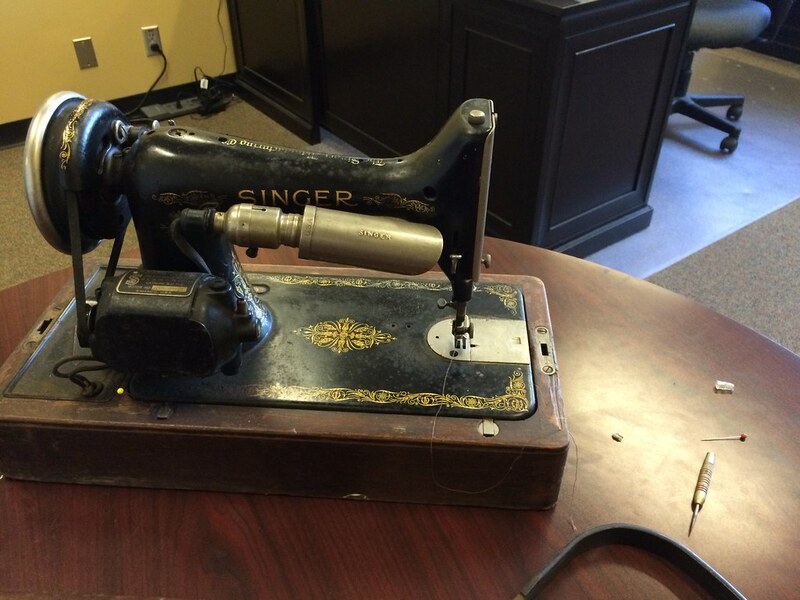 Are you a sewing machine collector? Your new machine reminds me of the machine my gramma had. I still regret that I didn't take it after she died. It would have been such a great memento to have. I think so many of us have stories like this, Teri! I hope my auntie has my grandmother's old machine. I assume no one would have thrown it away ... ! Ridiculous, but I'm always surprised when I hear people for the first time and they have accents! I've just had my mum's Singer (circa 1968) fixed and serviced on the condition that I get to inherit it one day! I'm really tempted to sew something with it just for fun before I give it back. I loved your Me made May photos. Not just your clothes but the realness of it all, you rock! I don't have an accent! YOU have an accent! Hehehe. Wow - dramatic reveal! How cool is that old Singer. (I sew on an old, but not very glamorous Bernette.) Keep up the selfish sewing! Great MMM wrap-up, and what a find! I love that the machine came in a locked box. Don't mind Steve, you just keep collecting sewing machines! You rocked Me Made May! I look forward to reading about those yet to be blogged projects.